Despite a resume that includes an almost Homer Simpsion number of career experiences, Peter Parker sure has a difficult time keeping work. 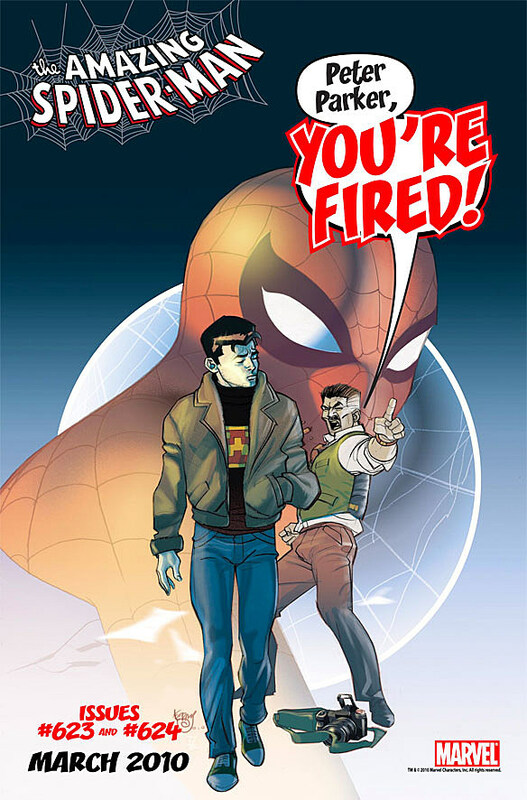 Spider-Man's secret identity had been paying the bills relatively well of late as an employee of Mayor J. Jonah Jameson's office, but circumstances will see him booted from his post in this week's "Amazing Spider-Man" #623, quite possibly leaving him at a loss for webs and threads. Now, I'm not trying to nitpick a fantasy drama, but I must admit that there are times when I find Peter's job woes frustrating. As a freelancer myself, I understand Pete's dilemma. Photojournalism, like all media, is not a super safe job market right now - especially if you aren't a fairly dependable cat and other gigs with that level of flexibility aren't always easy to come by. Still, as smart as Peter is I feel like he'd be able to keep a roof over his head with a wider freelance income. A guy with his powers could easily shoot insane stock photos and it's not like he needs health benefits when Night Nurse is on hand. Spidey's writers have done a pretty decent job of making Peter's job woes make sense in the context of his wider stories so far, so I'll trust them to keep at it into these upcoming issues as well. Still, it'd be nice to see a few modernized photojournalism alternatives considered in his future career pursuits.